When anyone thinks about the biggest sundial made up of stone than the place comes into mind is the Jantar Mantar Jaipur. It is one of the largest collections of the historical equipment of astrology, not only historical but they are the representatives of the architecture of that time as its name shows the meaning of “calculation instrument”. It is located in Rajasthan India and is one of the biggest ancient and very old monuments of the country. It was built in 1738. The fact about its significance is its being there presenting the thinking of the early Indians about the universe and the human life. The Jantar Mantar Jaipur is now one of the UNESCO world heritage sites. The instruments there are mostly made up of stone along with brass and they show the early Hindu Sanskrit beliefs with the Muslim theory of astronomy which affected the Indian literature during the Mughal rule. Entirely the instruments are the combinations of various thoughts and beliefs religiously and socially. Beside that it is a show of various civilizations India is rich in. Its positioning is according to the classical co-ordinates system including local, equatorial and the ecliptic. It is a place where a person can easily observe the astronomy principles with the naked eye. The instruments perform the functioning of the prediction for eclipses, time and the position of stars and other astral bodies. These had been named as the dakshinyantra, misrayantra, ramayantra, Rashivalayayantra, vrihatsamratyantra which is also known as sundial which is used to know the position of the earth and is the historical instrument of time measurement and is called great king of instruments. 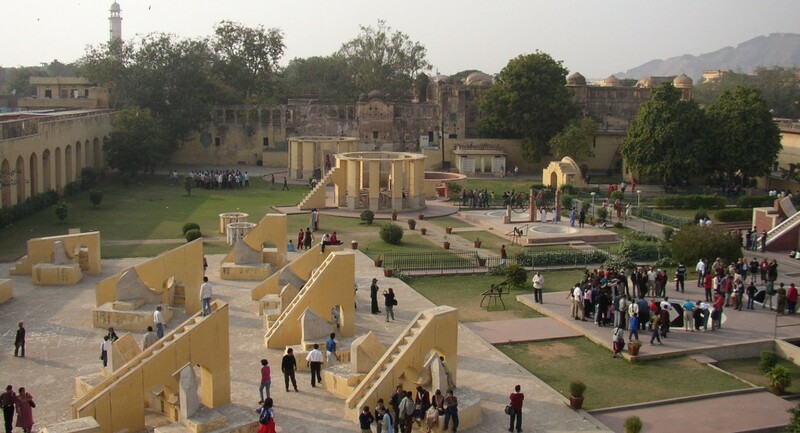 The used material in the construction of the Jantar Mantar Jaipur is red stone, marble, bricks and bronze. Many times it got destructed in the history and its final restoration took place in 2006 after which it went under the monument act and has been regarded as the national monument of Rajasthan, India.